MAGNUM master micro controller board with twelve 0-5vdc sensor inputs, four 5vdc digital inputs, ten 230vac 6.3amp relay outputs, four 0-10vdc analog outputs, keypad, 128 x 64 dot pixel STN monochrome graphics LCD with 2.8" diagonal viewing area, real time clock, MCS-I/O, RS-232, RS-485 and Ethernet communication ports. Mounted to a backplane and attached to a stand along with a keypad and display. User selectable 115 or 230vac operation. 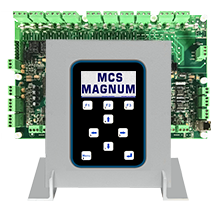 Description MCS-MAGNUM-DEMO, is mounted to a backplane and attached to a stand along with a keypad and display. Description MCS-TOUCH-15.4-DEMO, consists of a Magnum micro controller, a MCS-RO10 expansion board, a MCS-SI16-AO4 expansion board, a MCS-EXV DRIVER, MCS-500 Transducer and cable and a MCS-THERMOSTAT. Copyright © 2019 Micro Control Systems Inc. All Rights Reserved.